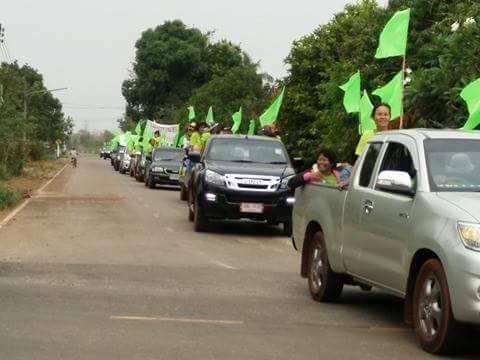 The police have accused a villager in Sakon Nakhon of breaching the Public Assembly Act for participating in an anti-potash mining event. On 27 March 2017, Satanon Chuenta, a member of the Wanon Niwat Environmental Conservation Group, reported to Wanon Niwat District Police Station  in the northeastern province of Sakon Nakhon. At the station, police officers informed him that he was being charged under Article 10 of the Public Assembly Act, which states that protest leaders have to give 24 hours prior notice to police officers of any protest planned in the area. According the summons delivered to his house by the police, he is accused of inviting other villagers to a gathering against potash mining on 12 March 2017. Satanon said that he was only one of the participants of the event, but not an organiser, adding that the event was more like a cultural event for the local community. The local environmental activist said further that the police tried to convince him to pay a 5,000 baht fine in exchange for dropping the case, but he refused as he believes that he did nothing wrong. In January 2015, the Department of Primary Industries and Mines gave permission to the Chinese state-owned China Ming Ta Potash Corporation to explore 120,000 rai of land in Wanon Niwat District for potash mining despite the opposition of the local people, who fear potential environmental damage from the mine. The police, military and local authorities banned several public gatherings against the potash mining company. In April 2016, two local people were charged under the Public Assembly Act for previous anti-potash mining protests.